NAVY outlasts Tulane, 21-14, Worth Scores Winning Touchdown. Worth’s late TD run gives Navy there 3rd win of the season. 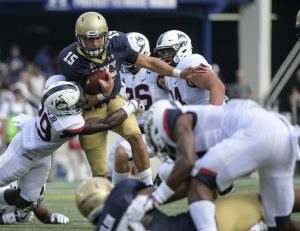 Quarterback Will Worth rushed for 111 yards and the winning touchdown in the final three minutes as Navy rallied to defeat Tulane 21-14 in an American Athletic Conference game on Saturday. Worth, a senior making his second start in place of Tago Smith, who suffered a torn right ACL in the season opener against Fordham, scored on a 1-yard run and then hit Toneo Gulley for a 2-point conversion to cap the scoring with 2:57 remaining. Worth had eight carries for 58 yards on the winning 10-play, 72-yard drive. Tulane’s Andrew Dirocco missed wide left on a 45-yard field goal attempt with 7:39 left in the game, setting up Navy’s winning drive. After a scoreless first quarter, Navy (3-0, 2-0 American) drove 94 yards on 15 plays and took a 7-0 lead on Chris High’s 6-yard touchdown run. The 15 plays were the most by the Midshipmen on a possession this season. Tulane (1-2, 0-1) responded with an 8-play (all runs), 75-yard drive capped by a 2-yard rushing touchdown by Josh Rounds. He had five carries for 52 yards on the drive. Navy: The Midshipmen have an open date next week before visiting Air Force on Oct. 1 in their first game in this season’s Commander-In-Chief Trophy series. Air Force leads the series 28-20, but Navy won last season’s meeting 33-11.